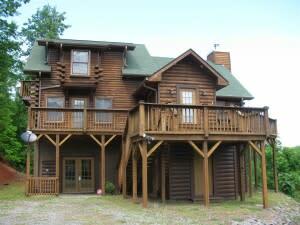 Deer Meadow Acres is a lovely well-appointed secluded log cabin minutes from Lake Lure Inn and Beach. The main floor boasts well stocked kitchen. Cook to your hearts content. Maybe just a simple breakfast, lunch, or preparing the families favorite dinner. Dining area seats 6 and there is a breakfast bar with 3 stools. Relax in the great room with cathedral ceiling, a wood burning fireplace, and comfortable couch and chairs. The Guest Bedroom provides queen bed and twin bed combination bunk. A full bath is just off hall. Bedroom has door with access to upper deck. 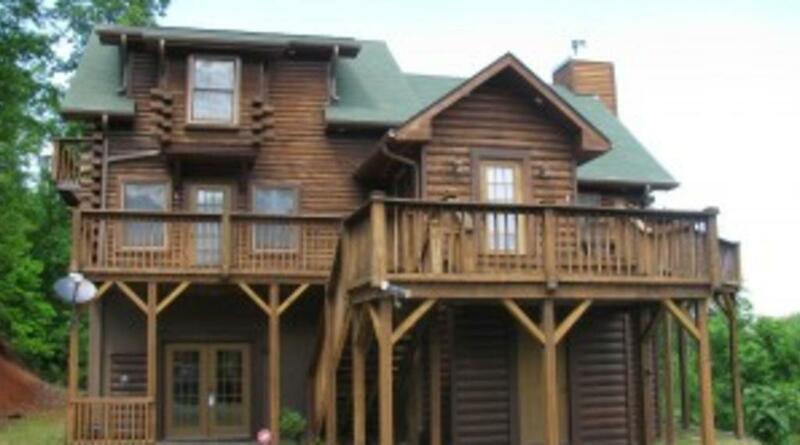 Head upstairs to master bedroom with queen bed, Direct TV with flat screen TV. Private Master Bath boasts 2 pedestal sinks, walk-in shower and jetted tub. From main level great room there is a spiral staircase with safety gate that leads to lower level family room for fun evenings watching movies and playing games. Access to lower level can be also from French Doors at ground level. Lower level has card table, kid’s Foosball table, couch, chairs, Direct TV with flat screen TV, DVD, games, toys, and puzzles. A gas log fireplace provides cozy warmth during the cool mountain nights. There is also a futon that allows for extra sleeping. Another Guest Bedroom has queen bed and French Doors to ground level. A full bath (walk in shower only) is off the hall. A full laundry area is just off the kitchen and provides access to the rear deck with propane grill for the Grill Master to show off their skills. Upper level deck also has patio table and chairs. A fire pit allows for evening chats and the ever popular S’mores. Don’t forget to look up and see the magnificent display of night stars. Deer, hawk, eagles, turkeys and other wildlife can be seen on the 4 1/2 acres of property that you can also hike on. Come stay at Deer Meadow Acres and enjoy a wonderful time in the mountains, the character of country towns and beautiful scenic road trips.